In a very conscious now of how Brazil is portrayed in the foreign (i.e. non-Brazilian) press. In the UK, there is very little news reported from Brazil, so I thought that I would cover this story from yesterday as best I can. 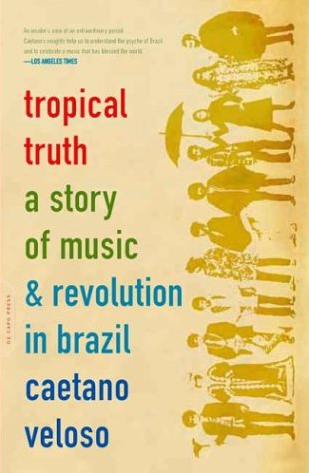 I have recently read Tropical Truth: A Story Of Music And Revolution In Brazil by singer and songwriter Caetano Veloso, one of the founders of Tropicalismo, a revolutionary movement formed in Brazil in the late 1960s. Veloso spent time in prison with his friend Gilberto Gil, and both had to come to London in 1969 to escape from the dictatorship which kidnapped, imprisoned and killed many young people in Brazil in this terrible period. So it was interesting to see the news from Rio yesterday, which saw a huge protest born of utter disgust and horror at a public celebration of the coup of 1964 by members of the military who played a central role in the killing and torturing. This video shows some excellent (although obviously that is not entirely the best work of course) footage from the streets as people protest. 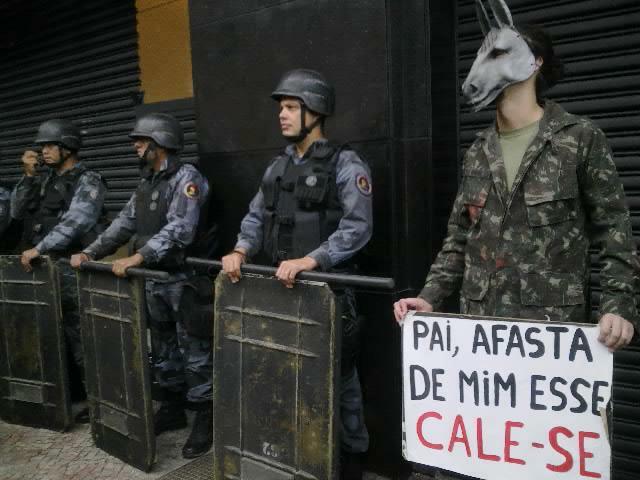 This is a very powerful image, from Movimento Direito Para Quem, and also one that you would never see in the UK or US, since it would be impossible pretty much for a protestor to get so close to the armed police officers, however peaceful.The poster shows the lyrics from a protest song Cálice. The lyric “Pai! Afasta de mim esse cálice” is a play on words. It means “father, take me away from this chalice” but also the phrase “cala-se” is the same sound as the single word “cálice” and translates as something like “shut up” or “forced silence”. A member of the military dictatorship was interviewed on a news programme recently, and was asked by the journalist about how he felt about all the murders of young protestors. He said “Ah, it wasn’t much, only one person disappeared each day.” The journalist was horrified, but this is the mentality that still prevails with these people, some of whom are of course still in positions of power, including the dreadful José Sarney de Araújo Costa, President of the Senate. But it is good to see Brazilians out on the streets making their voices heard. While the British press can only seem to see Brazil as either from a commercial point of view, as a country of natural resources to be exploited, or as the country of Samba, Carnival and football, I thought it would be interesting to cover some more events from the real Brazil, one that it still coming to terms with its past but which is creative, energetic and now attempting to break free from its past and the financial dictatorship of western hegemony and the IMF. ← Ciclismo na Grã-Bretanha: O que o Brasil Pode Aprender?